1. Are all climbing plants bad for your property? No – some are beneficial and attractive whereas others can cause damage to the walls, foundations and roofs and can cause serious damage if left unhindered. 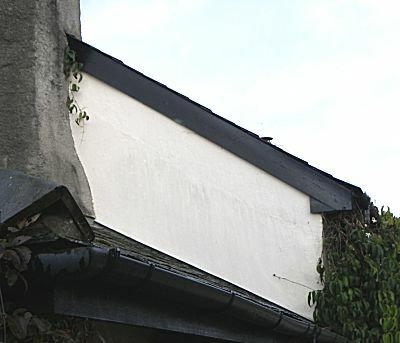 A climbing plant can improve insulation to the walls and can have either a drying effect (by preventing damp getting to the wall and sucking out any moisture within the walls) or prevent damp from drying out on a wall (by preventing the wind and sun getting through to the wall itself). 2. What sort of climbing plants should I place against the walls of my house? Only place climbing plants that do not have suckers. The suckers break through the outer painted surface or can break into the stone or pointing and cannot always easily be removed. An example of a plant with suckers is Ivy. 3. How can the plant stay against the wall? The best way is via a trellis or a series of wires or other structure that provides a frame for climbing with the plant being attached to the frame and not the wall. This will also, if cleverly designed, enable redecoration of the wall behind the plant. (See question 10). 4. Can climbing plants damage the foundations of my property? Yes, but this depends upon the type of plant and root structure, the type of foundations as well as the ground conditions, the water table, slope, aspect and other factors. The roots of most climbing plants are unlikely to damage the walls of a building, however this depends upon the type of plant as well as the type of building. 5. Does it matter how high a climbing plant goes? 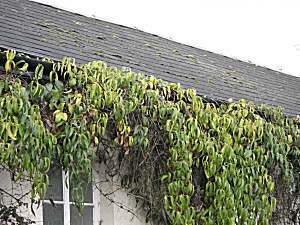 Yes – a climbing plant should never be allowed to grow into the roofspace nor in and out of the gutters. It can lift entire roof timbers and misalign the surfaces as well as break slates and tiles. It can also block and destroy guttering as well as provide a simple climbing frame for any stray rodent to enter the property. The entry holes forced by the plants can also provide a location of entry for insects like flies and wasps as well as bats. Regular annual pruning may be required. Climbing plants wrapped around the gutters can break the gutters and allow run off to saturate the walls. 6. So, a climbing plant should never go beyond the eaves? In general, yes, but at eaves height make sure that the plant does not block any vents into the roofspace as well as use any vents to grow into the roofspace. Climbing plants can sometimes grow into the roofspace and out through another aperture higher up near the ridge or even out the other side of the building. Through the eaves and out by the Chimney! 7. Which walls should I grow a climbing plant on? The south and west walls act as storage radiators of heat and will provide a more protected environment for less hardy climbers. Different plants will prosper or wither in different locations. 8. Other factors to consider – underground? Depending upon the topography and the design of the eaves overhang of the property, some properties have too dry a soil next to the house walls for some types of climber to thrive. This is why some climbing plants fail in the first year. It takes several years sometimes for a root system to get established and grow deeply enough to provide water to the plant as the ground next to the property is that much drier. Watering the plant for the first year or two can sometimes solve this issue. 9. Does soil content matter? The soil content can vary next to the property with the ground possibly affected by the building materials in use in or around the planting area. Different types of plants require varying degrees of soil acidity. In fact, some plants are very sensitive to soil pH. Rhododendrons and heathers will not tolerate lime in the soil. On the other hand clematis prefers an alkaline soil. 10. How do you redecorate behind climbing plants? Decorating walls behind climbing plants is very difficult if the plant is already in situ. Sometimes it is not practical to do so. Should you be planting a new climbing plant on a wall and placing a framework for it, it is possible for this to be designed with removable wall ties or even be a hinged frame, thereby enabling the plant to be laid down on the ground prior to redecoration of the walls. Lowering the plant into a sheet or tarpaulin is one established technique.